Why Is $5,000/ Month Our Minimum Media Spend? - Take Some Risk Inc.
Budget planning for the year? If you plan to launch a new paid channel this year. Learn why we feel that $5,000 is the minimum you should invest in a new channel. All things being equal. Today I want to talk about money and power. Well really just money and the power of testing out a new paid channel. We often get asked by clients and potential leads how much should they put aside to test a new channel. This could be launching on Google for the first time or maybe they have maxed out Google and want to test out Bing Ads or Facebook next. Let me share with you what experience has taught me to hold true. 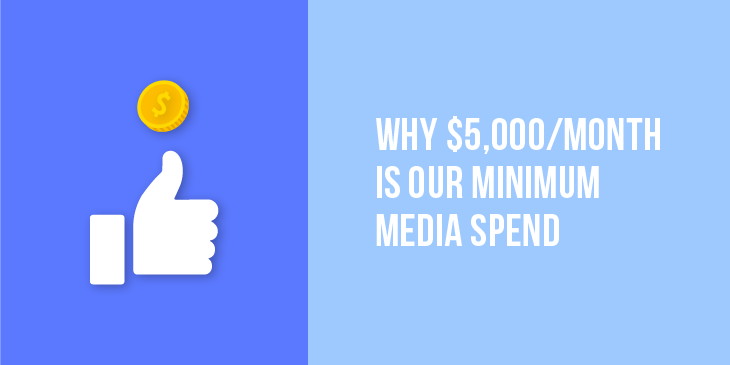 By the end of this article you’ll learn: Why Our Media Spend Minimum is $5,000/ Month. There is to much out of our control with their website and the experience someone has after clicking on an ad. Sure, we build custom landing pages for our SaaS and technology clients but even then we still don’t control the main marketing site or the funnel after that landing page. Having a test budget of $5,000 to spend on a new platform means that if our first idea is wrong, we have the room and opportunity to test out a second and sometimes a third idea. We could have the right keywords and the wrong landing page but with only $2,000 or $750 to spend we would not have known that. We recently had an auto client where we got the wrong keywords on the first pass. We luckily had room in the budget to test out our second batch and that did the trick. We saw the conversions flow into the client’s site, which wasn’t anything fancy, once we turned on the second batch of keywords. Testing and learning is something we do with every client and each test is a learning opportunity for everyone. If it’s profitable, we will give you more money. I always hear this line when someone thinks they only need to spend $1,000 on Facebook or Google Ads to make it “work”. This often comes from someone who does not always understand digital marketing, maybe someone told them that is all they need to spend or they did not do the research to realize that many businesses spend in the hundreds and millions of dollars a month online. The VC backed startups we talk to are sometimes the most uninformed I found over the years. I know a lot of agencies and freelancers will take on a client where the spend is that low. We are not interested in that business. It’s rare that clients actually honour that verbal contact and invest more money down the line. I find if anything, they want you to keep getting that CPA lower, even if it means that the quality of the customer suffers. Or even if it means not helping them build a profitable business with long term potential. Investing in digital marketing is like building your dream home. If you don’t invest the right amount of money, you won’t be happy with the end results. If you started to invest money and build your dream home. You’re going to want to see a return on your investment, which means you see the value of your property go up or maybe you rent it out long-term or list it on Airbnb. However, if you went the cheap route and didn’t put enough money into your home to build it, you are not going to like the end result. The value of your investment goes down. The same thing happens with your paid advertising. You spend that $750 or $2,000 and then when you don’t see tons of signups or sales on your ecommerce store. Maybe you or your boss points to your effort and says something like “see I knew this wouldn’t work”. I have seen this play out and it’s an awkward situation for everyone involved. The situation not working out wasn’t because advertising doesn’t work. It does even when we don’t think we are not susceptible to it. The reason it didn’t work was because you didn’t put the upfront investment in it to see your money back. This also applies to your creative assets and the time you put into it. Making the right meaningful investment is key to seeing success in each part of your business. The clients who can afford to test out a new paid channel for $5,000/month general have a business that is working and growing. The business has some consistent revenue and they feel it’s the right time to grow it. They truly see the $5,000/month as an investment and not a cost to their business over the long-term. Clients in this area of growth are making 6 figures a year and need help scaling and or launching on new paid channel. Any clients we work with below the 6 figures a year is usually taking money out of a VC investment round. That’s not always the case but it has been for a number of clients. A few of our New York City clients fall into this area. Everything above is based on a client marketing across a country and having a large enough market size to warrant $5,000/month in media spend. We don’t do any local based marketing or have a client who only targets one province or state. At that point your budget would be different. If you want to make paid advertising work for your brand then you need to make that investment from day one. That is it for this week. See you next time.